Songkran Festival nicknamed water festival or water splashing festival is the most famous festival in Thailand. It is an very important event in the calendar of Buddhists, and world's biggest water fight takes place during Songkran holiday. Songkran is Thai New Year celebration. Songkran came from Sanskrit, which means approaching or passing. Read this article and you will get an overview of "The holiday of the biggest water flight in the world!" Splashing water during Songkran Festival is a symbolic start of Thai new year celebrations, people look forward to the new year that can bring happiness and blessings in their lives. While they also pay thanks for the blessings that they got in the previous year. People clean their houses to welcome the blessings of new year. Rice is a traditional crop in the agriculture industry of Thailand, which needs a lot of water amount for its production, as rice is major crop being cultivated in Thailand, so, water is the most important thing that can merits its own in the celebrations of event. Songkran celebrations which they linked to the moments of stars and heavenly bodies. There is a great possibility that the word Songkran may be interpreted as “move or change in position of the Sun“. Water festival in Songkran celebrations may refer to the passing of an astrological year and the starting of a new year. Of course, you can't forget that Songkran Festival is the most important religious festival. Although the connection between water festival of Songkran and Buddhist religion, which most of the people in Thailand supports is established in a best manner. People belong to the Buddhist religion make their decisions according to the moment of planets and stars. Before the time when Buddhism was started to spread from the subcontinent (India) to Thailand, many of old prayer buildings and temples were built along astrological lines, which show the importance of astrological stars moments in Buddhist religion. April 13th: the first day of Songkran, there are parades of Buddha images all across the country. This is the extract day the biggest water fight starts. April 14th: the second day of Songkran, called Wan Nao is the National Family day that is the time family numbers spend quality time together. It celebrates the old Thai New Year's Eve. April 15th: the third day of Songkran, Thai New Year begins. Parties and crazy celebrations are everywhere with water fights, parades, concerts and more! Other than Thailand, Songkran is being celebrated in some of south Asian countries too. they may have different names for their festivals, but all of that have water fight celebrations which includes a heavy amount of water for fun during the celebrations of New year. Most of us may think that this is a traditional event but it can be more than just this and may have historical importance in entire Southeast Asia. This event is the new year celebrations for the communities of Southeast Asia that belong to Buddhist religious for example, Burmese, Laos and Cambodian. The New Year celebrations last at least three days. If you want to be a part of celebrations, but do not know well about which destination of Thailand you can decide to enjoy in Thailand. There is no need to worry because we have a list of places that you can select as your destination place for being a part of Songkran celebrations, which can be an ultimate guide for you to take a better decision for you. Songkran celebrations in Chiang Mai - the Greatest! Chiang Mai is the place where most popular parade and water festival took place, In Chiang Mai, celebrations are take places around moat and on Urban Culture Street, known as the heart of city. See more: Ultimate Guide for Songkran Festival in Chiang Mai. People believe that they can wash away all of their previous year's bad luck by washing each other with water guns, water buckets and water cannons at the famous Bangla road in Patong Beach in Phuket. See more: Songkran Festival in Phuket. 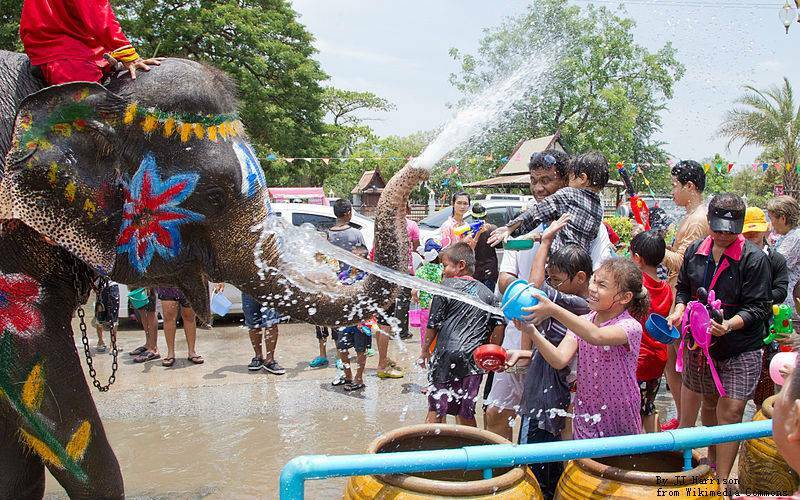 You can enjoy a splashing elephant event in Ayutthaya during the new year celebrations. In Pattaya city, you can be a part of Songkran celebrations on 19th April, which is also known as Wan Lai festival. -- Read more about Songkran Festival in Pattaya. 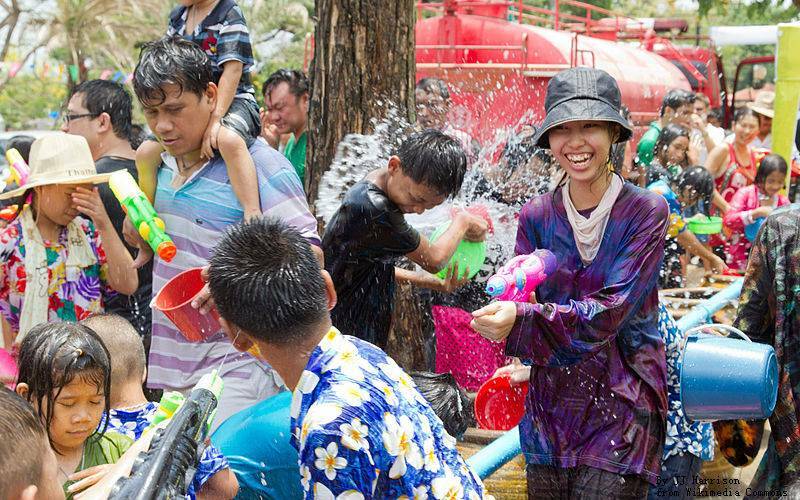 During the celebrations of Songkran, you may face water fights when you go out of your place, it is because during this event civilized Thais become crazy. So, if you do not want to be a part of water fight, it is better to stay inside, or face the water with smile and enjoy the celebrations. -- Read also Ultimate Guide on how to survive Songkran Festival. Khao Chae is a most favorite dish that they serve during the celebrations of Thai New Year which is featuring rice in jasmine water and being served with a variety of tasty condiments. For the tourist interested in interacting directly with locals and deep insights for local culture. We offer you an pleasuring and fun-filled manner. The annual Songkran Water Splashing Festival takes place in the month of April is the perfect occasion. Plan a Songkran Festival visit in your Thailand tour now! See those popular tours for inspiration. Contact our travel consultants and we will tailor-made your unique Thailand tour according to your interests, dates, requirements and budget! Contact us and we will customize your tour to this carnival in Pattaya!